The accelerating pace of change has placed new strains on the globe and made more urgent the search for sound evidence-based policy and investment in education and science to ensure that the world can feed an extra two to three billion people without irretrievably damaging the planet. Some themes in the global debate on world food security recur: the need to ensure that growth in the availability of nutritious food more than keeps pace with growing demand; the importance of education and training, especially of girls and women; the need for sound economic and open trade and investment policies; and the need for increased investment in rural infrastructure; and the pressing issues of population growth itself. Whether or not the world can adequately feed an extra two to three billion people, without irretrievably damaging the planet, has also been a consistent theme over recent decades. It was first given prominence by the Club of Rome in the 1960s; it was partially muted with the success of the Green Revolution of the 1980s and 1990s; but it was echoed more recently in the global debate as growth in agricultural productivity fell and the world experienced two global food price crises within the span of a few years. Many remedies and solutions have been postulated to this core question. Most revolve around the scope for evidenced-based policy, education and training and a search for answers from science and human ingenuity. The accelerating pace of change, the rapid emergence of disruptive phenomena such as extreme weather events, deep financial crises in North America and Europe, the surging growth of the economies of Asia and some other regions, and the emergence more quickly than expected of a global middle class with changing diets have placed new strains on the globe and made the search for policy, technology and education solutions more urgent. All the while, science is revealing more about pressures on the global environment, its soils and water, and of threats of invasive species and crop, plant and animal diseases. Some argue that human activities have pushed earth systems beyond the stable state of the Holocene into the Anthropocene. At the same time, new molecular and information technologies have given scientists and extension systems new tools to lift crop and livestock productivity thresholds and to raise take-up levels by farmers and livestock holders of new technologies and agricultural practices. We devote about 16 million square kilometres, roughly the size of South America, to growing crops; and roughly 34 million square kilometres, about the sizes of Africa, to rangeland: in total, 40% of the Earth’s land base. Most of the land that is left is in the Siberian tundra, the northern Canadian Arctic or the rainforest in the Amazon, the Congo and the Indonesian Archipelago, so the remaining land base that we might have to expand into is essentially rainforest or desert or Arctic. The bottom billion people whose food supply is insecure today never benefit from this large-scale deforestation. To give just one example of the changing political and economic environment: fiscal and monetary developments, ageing populations, burgeoning welfare spending demands and deteriorating tax revenues have placed pressures on national budgets in many advanced countries and even in emerging economies. While advocacy efforts continue apace and must be sustained, it is proving increasingly difficult for some advanced countries to increase government funding allocations to national and international agricultural research and to development assistance programs. 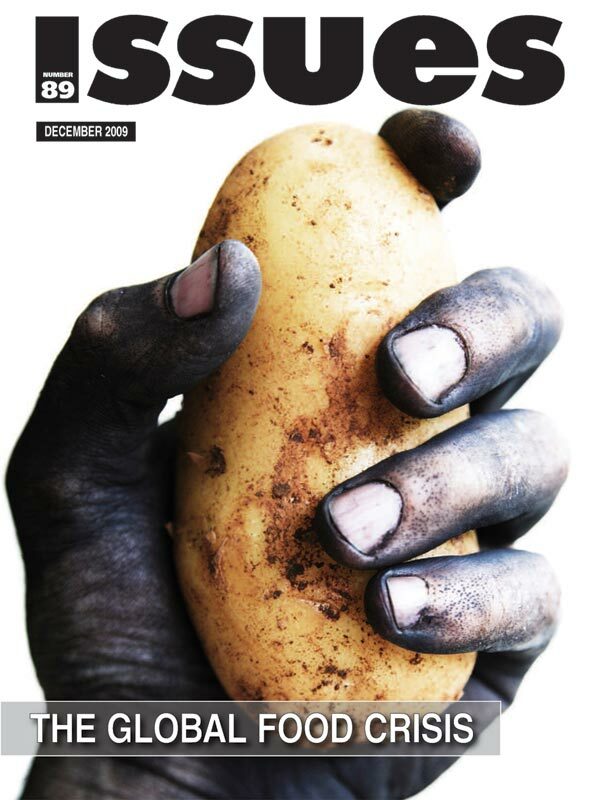 In my earlier article in Issues (December 2009) I asked whether productivity growth in the next 50 years will meet the growing demand for better and more nutritious food. This was considered most recently at the 2012 Crawford Fund Parliamentary Conference in October 2012. The quicker than expected emergence of a global middle class suggested that there are four billion people already on this planet who are getting much richer or who are joining a global middle class. With this growth comes an increased demand for more nutritious foods and also a demand for meat and dairy products. These products, in turn, place greater demands on natural resources. Increased oil prices have been translated into investment in biofuels based on food grains. Asia’s extraordinary ascent has already changed the Australian economy, society and strategic environment. The scale and pace of change still to come means Australia is truly entering a transformative period in our history. Within only a few years, Asia will not only be the world’s largest producer of goods and services, it will also be the largest consumer of them. It is already the most populous region in the world. In the future, it will also be home to the majority of the world’s middle class. Although the characterisation of the emerging Asian middle class is cast in the white paper in terms of the trade opportunities it represents for Australia, the implications for global food demand are clear, as are the changing dietary patterns on health and natural resource exploitation. While countries in Europe and North America are barely growing in terms of gross national income, several countries in sub-Saharan Africa have annual growth of 5–10 percent (for example, Botswana, Ethiopia, Kenya, Tanzania and Uganda). According to NEPAD, several African countries are close to meeting a target of 6 per cent in 2012 (www.nepad-caadp.net). The rapid emergence of African economies means that the emerging economies now termed the “BRICS” (Brazil, Russia, India, China and South Africa) may soon be joined by several more booming African countries. These global themes are reflected in The Next Convergence authored by Nobel Laureate Michael Spence. At one level, the solutions emerging from the Crawford Fund’s 2012 Parliamentary Conference and other studies are clear enough (see box: Emerging Solutions). The Crawford Fund has suggested that the search for solutions, through agricultural research and development, should be conducted on a wider canvas considering interactions between agriculture and other sectors and industries such as mining. It has also called for greater consideration of the role of the private sector. The constraints on public sector spending, especially among industrialised and emerging countries with burgeoning welfare costs as their populations age, may point to the need for greater involvement of the private sector and for commercial solutions. The Crawford Fund brief suggests that “a successful ‘Green Revolution’ in Africa will require viable private sector participants in the emerging economies of Africa”. A success story is the widespread adoption of mobile phone and other information and communication technologies across Africa. “Small-scale producers [can] access information to guide their decisions on markets, input purchases and the like (for example market prices on tradable commodities, extension services to improve crop and livestock productivity and weather forecasts, including predicting extreme weather events)”. The private sector is interested in emerging markets; some major agrochemical companies have targeted investments in Africa. Efforts are also being made by developing country governments and donors to encourage private sector investment in research and technology delivery for developing countries through such mechanisms as advanced market commitments and through the formation of public–private partnerships. Intellectual property issues that might inhibit private sector participation are also being examined. A number of international agricultural research centres are making technologies available under licence to small- and medium-sized enterprises in developing countries. Revenue from mining (and other resource extraction industries) is an important source of national income for emerging economies. Mining attracts private investment in emerging economies from large international mining companies. Competition between agriculture and mining for natural resources (especially land and water) may be overblown. Land occupancy by mining is relatively small for each mine, and mining is a relatively minor competitor for land and water and a relatively minor contributor to land degradation compared to poorly managed agriculture. Moreover, mining exports have become of growing importance to many developing countries as well as to Australia. With strong governance structures and policy frameworks, as have been demonstrated by a number of countries (from Norway to Botswana), mining can provide a boost to national economic growth and prosperity. There may be competition between agriculture and mining for skilled workers and deleterious impacts on local communities, including the impact of mining on indigenous communities that may be asked to resettle away from proposed mining sites. But agriculture and mining can co-exist. For example, mining companies have shown that agricultural development opportunities, such as land for mining workers to grow their own food, can coexist with mining ventures. Rehabilitation of land at mine sites is required by law and occurs in practice, during and after mineral extraction. A mining sector that is environmentally and socially responsible can help advance local public and private standards of production, business, governance and environmental protection in a country. Mining entities can partner to procure supplies from local producers. Local agricultural producers can be actively encouraged by a mining entity to improve production to meet mine procurement supply standards and volumes over time for mutual benefits. Skill sharing of selected mine workers to assist local producers to build and maintain public infrastructure as part of a corporate social responsibility program. Local education and skills training can be catalysed by a new mining activity. Favourable outcomes in many of these areas can be aided by knowledge of best practice and through research. Equally, there are opportunities for co-resource exploitation, such as sharing infrastructure and technology. Income of small-scale producers can be increased by part-time employment in other sectors, including mining. Food security comes not only from producing food (availability) but also from people being able to buy sufficient food (access), thus addressing two of the key elements of food security. The way forward is largely dependent on agreements between mining companies and governments in developing countries. It also rests on the quality of policy, and of governance and financial structures in the developing countries. Australia should grow and export as much food as it can within the constraints formed by its natural resource base and by market demand and prices. As Australia in the Asian Century suggests, a globally competitive agriculture and food production system will establish Australian food producers and processors as a major supplier of more and higher quality food and agricultural products and services and technology to Asia. Australia should continue to develop its own knowledge base, especially in semi-arid and tropical agriculture and in human and animal health and nutrition in the tropics; and it should strengthen its human capital in agricultural sciences and climate change, including through enhancing the mobility of our scientists internationally and through encouraging more young Australians to contemplate a career in the agricultural, biological and ecological sciences. As it builds its science and technology capabilities, partnerships in research with Asia, many of them founded on the base of ACIAR (Australian Centre for International Agricultural Research) and AusAID programs, will evolve into both mutually funded and commercial arrangements. Some already have. Just as Australia now contributes to the diets of 100 million people through its research and technology capabilities (compared to the 40 million or so people it helps to feed through its food exports), growth in food exports could be more than matched by growth in related services and technology. Education, especially of women and girls, is pivotal to success in developing countries and should be addressed in all aspects of aid delivery; a strengthened science, technology and policy development capacity is crucial to economic growth. Investment by the aid program in rural research and development is needed to measurably improve the well-being of the increasing number of poor and undernourished people in the world. This must be sharply focused in most cases on smallholder farmers who have not yet benefited sufficiently from past interventions nor from the potential of modern science. A greater proportion of our aid program needs to be directed towards sub-Saharan Africa and the remaining areas of extreme poverty in the Asia–Pacific region. Such a move may be consistent with the sentiments of Australia in the Asian Century. A progressive redirection of aid away from the richer countries of the Asia–Pacific could be replaced over time with mutually funded programs of science cooperation (as exemplified by the India–Australia Strategic Research Fund) and with export of research and technology services to the region. Moreover, by building relationships with African countries through training and research partnerships, we might well be laying the foundations for Australia and the African century, much as the Colombo Plan did with Asia beginning some 60 years ago. The Task Force recommended an integrated set of measures recommending assisting developing countries build a cadre of policy professionals so that they can develop the sound agricultural policy framework that is essential to everything else in food security; and that aid programs should invest in a portfolio of interventions suited to varying national circumstances covering strengthening of research and training institutions, primary and secondary education, research and innovation systems, public and private extension services and farmer education, and marketing infrastructure. These recommendations were accepted by the Australian Government and, by and large, have been implemented. Also, funding for ACIAR and the international agricultural research system has been expanded. The establishment of the Australian International Food Security Centre within ACIAR with its focus on “bridging research and practice” provides Australia with a leadership opportunity to help to close the gap between achievable and actual yields, a major problem in sub-Saharan Africa. The Food Security Centre also has the opportunity to give greater licence and freedom to partnerships borne of aid programs to evolve into longer term commercial ventures. Clearly there are opportunities for Australia to assist mining development in Africa and elsewhere. Already, mining investment flows from Australia to Africa approach $20 billion. But that is another story. Much of the material in this paper is drawn from the Crawford Fund’s Agricultural Research on a Wider Canvas project and the proceedings of the 2102 Crawford Fund Parliamentary Conference. Both are available at www.crawfordfund.org.